"Captain's log, stardate 5591.2. The crew of the Enterprise is ready for some well-deserved rest and recreation. Therefore, we have set course for the so-called "Shore Leave Planet" located in the Omicron Delta region. The uninhabited planet was constructed long ago by a highly-advanced alien race. Its sole purpose is to provide fun and amusement for space traveling passers by." As our crew begins to enjoy itself on the Shore Leave Planet, they discover that things again seem not to be going according to plan. The computer controlling the planet's amusements seems to have lost control, and it has designs on the Enterprise in orbit. Surmounting various obstacles, Kirk and crew reach a kidnapped Uhura deep in the bowels of the planet's control machinery. They convince the computer to abandon its conquest and to appreciate its designated functions. Dammit, Jim, I'm a Doctor, not a translator! In another "TOS Sequel," we return to shore leave planet. Here is an example of a TAS episode that improves on the original. I had some issues with the original "Shore Leave," mainly that the "internal fantasy" element was undeveloped and that the pacing was rather turgid. 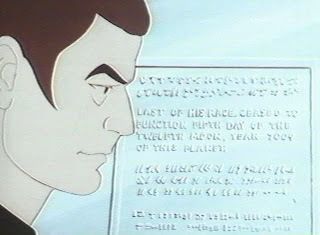 This episode bypasses interior fantasies, as the computer has its own ideas. Pacing is rarely an issue in a 22 minute show. So a rating of an episode like this depends on how well it gets things done in the brief plot it has. And, except for a pat ending, things are pretty good. Uhura sings, and gets one of her biggest parts to date, as she argues with the computer on the meaning of slavery. We get a speaking role for Lt. M'Ress, by Majel Barrett. Um, yeah. I like that they expand into non-humanoid aliens in TAS. But M'Ress is kinda dumb. As far as tension goes, a Pleasure Planet malfunctioning is better than a Pleasure Planet which is just confusing its visitors. There is actual peril. There are lots of technical little things to admire in this episode. We get a view in the shuttle bay of some new model shuttlecraft. A "phaser bore" drill is requested for beam down. The computer failure on the Enterprise leads to an artificial gravity failure, which never could have been done on TOS. Seat belts on bridge! There are some nice backdrop paintings on the shore leave planet, as well. There is good antagonism between Spock and McCoy, clearly the writers know and love TOS and are riffing on established character traits. Basically, almost everything about this story is better than its predecessor. Unfortunately, and perhaps because of the short time allotted in a cartoon, the conclusion is almost unbelievably pat. A computer which heretofore had attained sentience and was bent on killing people because of its position of servitude was basically talked down by some humans in about 30 seconds. This drags down all the positive elements of the preceding 20 minutes and puts this episode squarely in 3 territory. Kevin: I agree. This may be the one follow-up story in TAS that exceeds its predecessor. I will say Kirk's outmaneuvering of the computer was a tad egregious here. "I will destroy you." "Have you considered not destroying us?" "No. Now that you mention, I will not destroy you!" It's not his take-down of Nomad, is all I'm saying. That aside, some great voice work by DeForest Kelley, and some really good scenes with Uhura really sell this episode for me. I also like seeing the phaser bore. A recurring theme of our reviews is how the show really excels as taking advantage of the fact it costs the same to draw boring scenes as exciting ones, and they really go all out in fleshing out the universe. It's a testament to their care for the franchise. This isn't just the next money making scheme; they are adding something, regardless of the debate on its canonicity, important to the franchise. I've giving this a 3 as well, for a total of 6. That's 2 points better than its TOS progenitor.